As expected, Uber has taken an initiative to compete with Careem. The ride-hailing service have officially announced to launch rickshaw services in Karachi, starting today. Karachi already has rickshaws as the most common mean of transport due to congested roads and cost efficiency. With uberAuto, you would be able to roam around the city with minimal costs. UberAuto has been launched for the convenience of the customers in terms of financial help and time savings when hailing a ride. It is expected that Uber will move to other major Pakistani cities with this initiative as well, due to similar crowded road patterns and locals preferring rickshaw over expensive alternatives. The base far is said to be Rs 35 and Uber is charging Rs 3 per kilometer (or Rs 1 per minute). The minimum far has to mount up to Rs 50, which is compulsory. 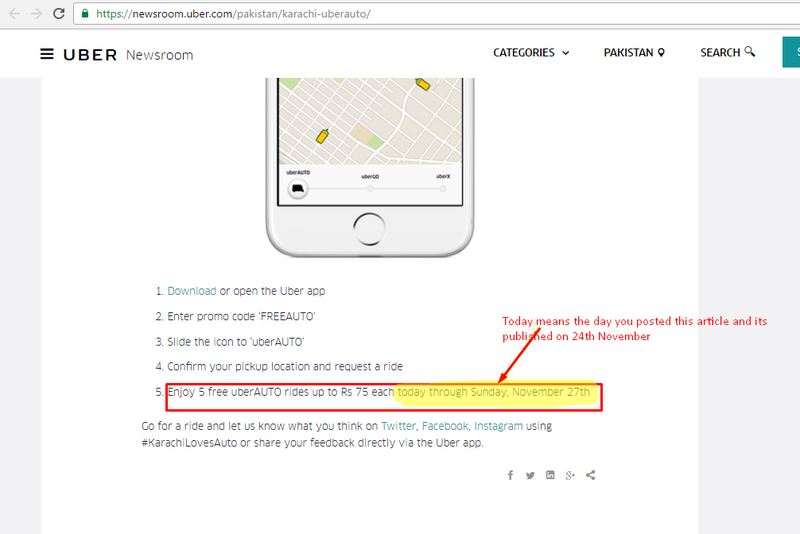 Just like when they launched in Lahore, uberAUTO is giving 5 free rides up to Rs 75 through Sunday, 27th November in Karachi as well. It should be recalled that when uberAUTO first started in Lahore, the rickshaw fares were set to Rs 45 as base fare. Per kilometer, they charged Rs 4. However now, they have lowered their rates to attract more customers. To book a rickshaw, the process is much similar to before – when ordering a car. The promo codes are available for uberAUTO too, even the prices of the rickshaws are far too cheap already. Download or open the Uber application. Slide the icon to ‘uberAUTO’. Confirm your pickup location and request a ride. Note: The actual fares may vary depending on traffic and routes. great step, KHI is the biggest market for Autos and they will earn huge from Autos. At last we will free from the hassle of maghaz mari with rikshaw drivers on rates. Hurrah to Uber. Yes their rates are cheaper KMQ. You should give it a try. acha if you say so, chalo main kal ke liye hi book karta hon lets see kaisa rehta hai experience. But kia liyari main aaenge yeh log? Bhai yeh article main hi likha tha. No its not that, Rs. 1 per minute will be charged regardless of anything. Lyari se bahir order kar k dekho phir. Sir it would not be easy for them to implement such low rates in Karachi as I have been using Uber Go since the start of service and trust me their drivers are way worst than careem’s. If you ask them to wait even for 15 min, they will end your ride and leave you on spot without hesitation. If you are sharing ride with your friend(s) and ask the driver to stop at one or two places, they will either simply refuse or force you to end the ride and start again in order to add in the number of rides whereas the base fare would be charged to customer again. Of course they shouldn’t wait for 15 minutes. This is pretty much huge time period that they can’t give. why can’t wait when waiting time is part also mentioned in tariff? Ishtiaq bhai yeh check karain, Ahsan bhai kia keh rahe hain. Is tarah bhi hota hai is tarah ke kamoon main. Haan yar kia karien KMQ. Unfortunately jaisa nahi hona chahiye waisa hota hai. Update your Uber app. Then you’ll see the option of Auto and free promo is from 25th to 27th not today. So beware or else you’ll be charged. I didn’t find a single rickshaw within last one month in Lahore. Yes u r right, but there are plenty available in Karachi from the first day and it’s quite surprising. can we assume Lahoriye zyada ameer hain? Sir, yeh tou nahi maloom per mujhe lagta hai saray auto wale Uber pe ajyien ge Karachi main kyuin k is k anay se conventional rickshaws ko kam business miley ga. Kyuin k logon ko easy hoga ghar bethay cheaper rates pe transport avail karney ka. It’s more than half of what a conventional rickshaw wala asks u. Us k shahi rates se bach jayien ge log. Munh mangy paisey nahi dene parien ge. Is liye people will prefer Uber. Uber car jitna charge karti hai utna aam rickshaw wala rate bolta hai. Bilkul theek kaha Ishtiaq bhai, “Uber car jitna charge karti hai utna aam rickshaw wala rate bolta hai” – Agreed! Ye to lol ho gaya ? 95 bhi ho tou bhi it’s almost half of what a rickshaw wala will charge u from Hyderi to Bahadarabad. Isn’t it? 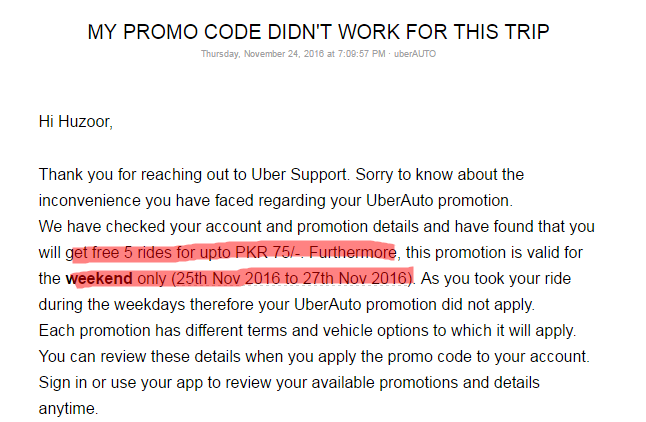 Chore hain uber walay inhu nay website main clear mention kia hai 5 free rides of 75 rupees free from today to sunday and kal main nay try kia koi promo nhi aya and 60 rupees pay kiya main nay and complain karnay par bataya gaya kay ya offer srif weekend kay liya hai 3rd class UBER. Just opened UBER.com first time today, is this service for only those who possess a credit card? Bhai ye to bohat sasta hogya. Pan/gutka khatay hoe drivers apne kachra rickshaw k andazay se paisay letay hain aur sab se ziada ghussay wali baat ye hai k sab ne mil kar ek particular rate set kiay hotay hain (agar ek jagah pe mojoud houn tou) aur koi bhi rickshaw wala ek khaas limit se neechay nahi jaata. Aisa bhi howa hai k maine ek taraf k 120-130 pay kiay hain aur kuch hi hours baad wapis aanay k 200+rs kyun k “sahab rush hai bohat”, “gas band hai aaj”, “gas bilkul end pe hai isliay aap aakhri sawari ho” type ki logics hoti hain inkay paas. Hospital, shopping, airport, food streets aur degar jagahoun k paisay moun maangay maangtay hain. Uber k aanay se kam az kam hum ab kisi hisaab se pay krainge, ye nahi k shopping ya khanay k liay jaana hai to double pay karo. That’s too kind to be true. I really see no sense in this. How could they charge rs.60 for an hour ride? I have tried Uber Auto and it was great experience. I travelled from Clifton near DUA restaurant to Shaheen Complex and the fare was 90 Rs. Normal ricksha would charge 200 or 150 rupees.